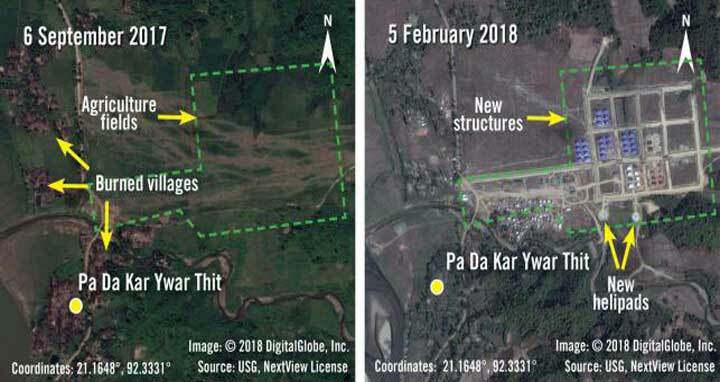 Dhaka, 12 Mar, Abnews: After driving nearly 700,000 Rohingya Muslims out of the country, Myanmar's military is building bases where some of their homes and mosques once stood, Amnesty International said on Monday, citing new evidence from satellite imagery. A harsh security response to attacks by Rohingya insurgents on 25 Aug sent members of the mostly stateless minority fleeing to Bangladesh and saw more than 350 villages destroyed by fire in western Myanmar's Rakhine state. An Amnesty report published on Monday echoed previous ones by saying the remains of some of those villages - and some buildings not previously damaged - had been bulldozed. “What we are seeing in Rakhine State is a land grab by the military on a dramatic scale," Tirana Hassan, Amnesty's crisis response director, said in a statement. "New bases are being erected to house the very same security forces that have committed crimes against humanity against Rohingya." Myanmar has asked for "clear evidence" to support the conclusion of the United Nations and others that ethnic cleansing has taken place in Rakhine. Amnesty said Myanmar's "reshaping" of the region where the Rohingya lived appeared to be designed to accommodate more security forces and non-Rohingya villagers, and could deter refugees from agreeing to return.